a/n: This is my entry for the monthly SimFic Short Story Challenge. The theme this month was “fool.” Although this story takes place in the Clanbuilding for Dummies world and fits in with the overarching story, it is meant to stand on its own. I hope you enjoy it! I know that’s a weird start, but I get confused myself sometimes. The guy standing in front and yelling at me to lose the camera? It’s his house. I just visit a lot. Some people might call me an idiot for being Elliot’s friend. Or a moron. Or a fool, if they were born in some olden-time year. Foolish was cleaning my shirts in the dishwasher. 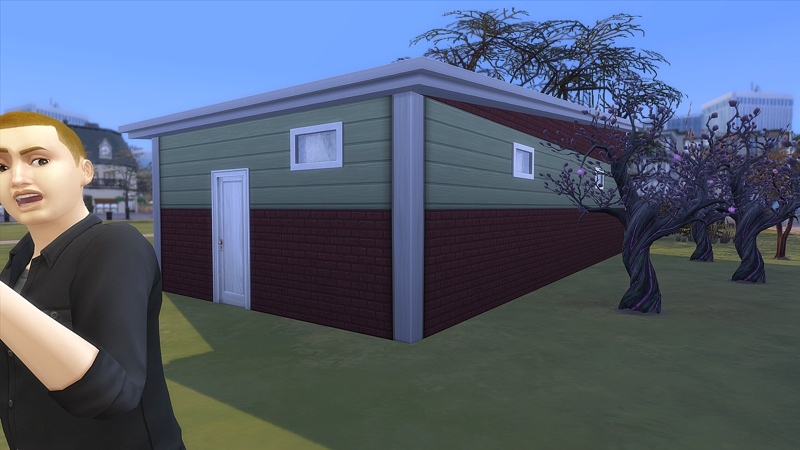 Foolish was buying an empty Newcrest lot and forgetting to bring a house. Or a toilet. Foolish might have been when I solved the toilet problem by becoming a vampire instead of visiting a hardware shop. But hanging around Elliot? That’s just fun. You see this store? This is also not mine. Also Elliot’s again. 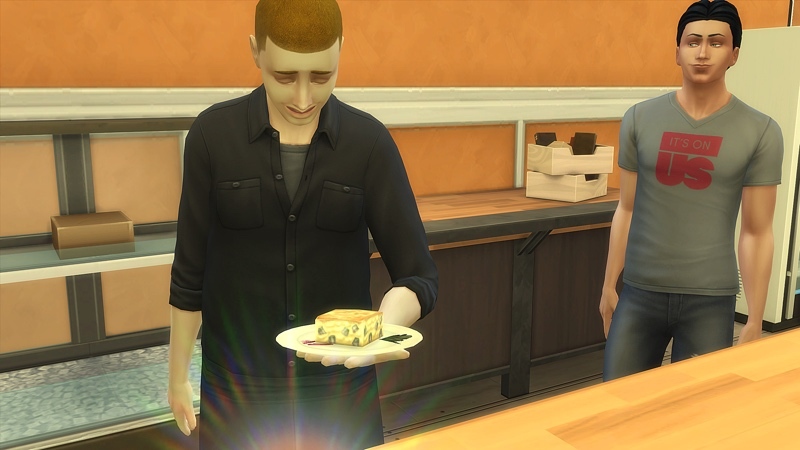 He bought it recently and wants to make it into a bakery. Which is cool and all, but he needs more flare. More originality. Enter me. 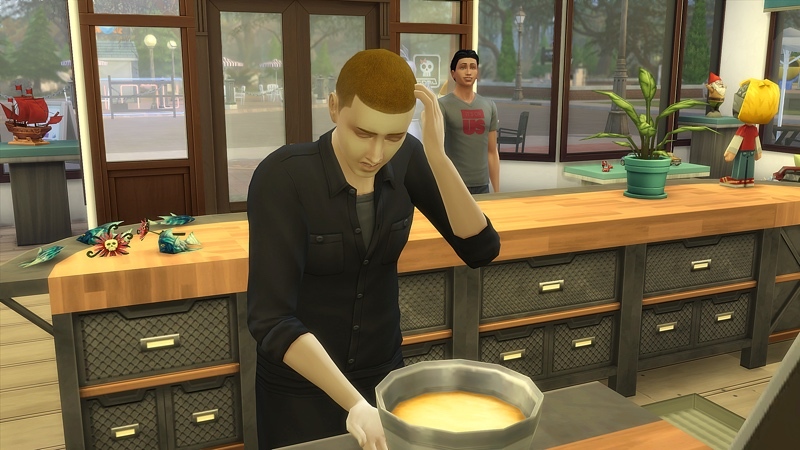 Normally Elliot won’t let me touch his cakes-in-progress, but today fate’s in my favor. I promise not to. But good friends know when to break their promises. 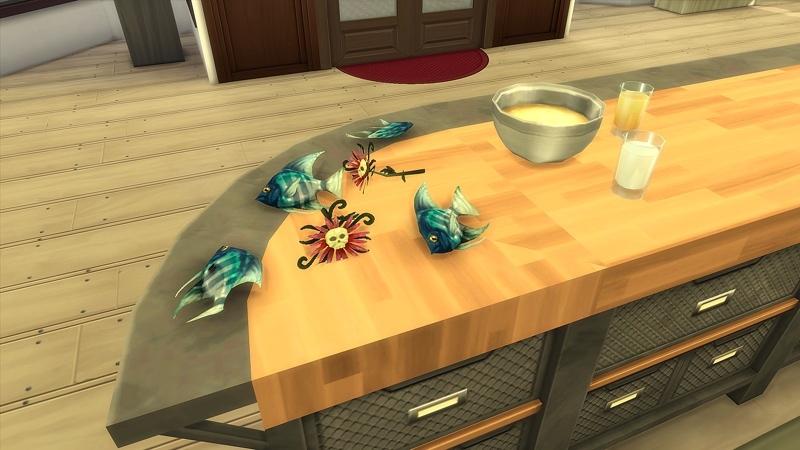 By the batter bowl, I see all the usual baking stuff. Milk. Flour. Boring. I look around for something better. 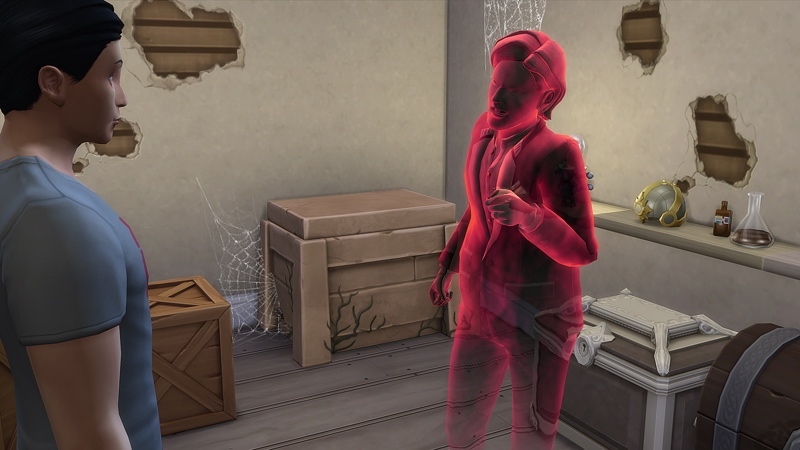 Most people would freak out at a see-through person, but here’s the thing with being clueless: you don’t scare easy. “No thanks,” I say, rummaging around. The see-through guy looks mad. Flaming red mad. “LEEAAAAVE!” he yells again. The second I hold up the flask, I know. This is the perfect secret ingredient for Elliot’s cake. But I’ve got to get downstairs. My bud could be back any minute. 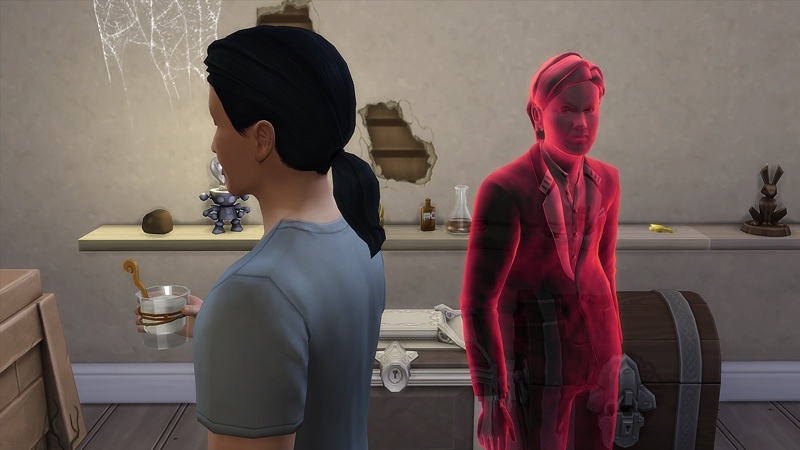 “Are you even listening?” the ghost person demands. The ghost mutters something about “mortals these days” and agrees that if I won’t be terrified of him, the least I can do is bring him some cake. I sneak my final secret ingredient into the batter just as Elliot comes back and mixes in the eggs. “Is it supposed to be glowing?” Elliot questions. Normally when Elliot asks me stuff, he’s more or less talking to himself. But this time, I feel like he really wants my opinion. So I give it to him. And even though I’m mostly making stuff up like usual, I’ve got a feeling that this time, I’m actually right. Tags: Clanbuilding for Dummies, Comics, Fanfiction, Sims. Bookmark the permalink. OHH <3 accidentally making ambrosia … maybe not such a fool after all LOL Very nice! Thanks! Yeah, sometimes it helps to be random. 🙂 Thanks for the prompt idea. And, you know, the organizing of this whole thing. Oh I like this! Ambrosia for dummies! lol Great story. Kyle may act clueless, but he is so sly. LOL!